The province is mandating a short-term reduction in oil production to defend Alberta jobs and the value of our energy resources. Premier Notley announces action on the oil price differential to protect the value of Alberta’s resources. 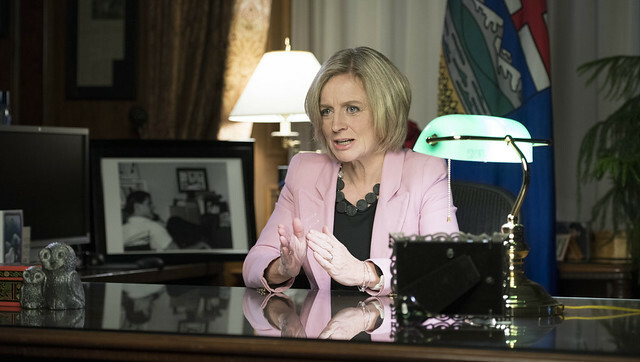 Premier Rachel Notley announced the temporary measure in response to the historically high oil price differential that is costing the national economy more than $80 million per day. The price gap is caused by the federal government’s decades-long inability to build pipelines. Ottawa’s failure in this area has left Alberta’s energy producers with few options to move their products, resulting in serious risks for the energy industry and Alberta jobs. Alberta is currently producing 190,000 raw crude oil and bitumen barrels per day more than can be shipped by pipelines, rail or other means. The amount of oil that is being diverted to storage is at record highs and storage is nearing capacity. Under the action announced, production of raw crude oil and bitumen will be reduced by 325,000 barrels per day to address the storage glut, representing an 8.7 per cent reduction. After excess storage is drawn down, the reduction will drop to an estimated average of 95,000 barrels a day until Dec. 31, 2019 when the rules supporting this action end. Relative to inaction, curtailment is projected to reduce volatility, narrow the differential by at least $4 per barrel relative to where it otherwise would have been and add an estimated $1.1 billion of government revenue in 2019-20 – money used to pay for roads, schools and hospitals. The Alberta Energy Regulator will implement the reductions starting in January 2019. The reduction amount will be reviewed each month to make sure production is in balance with transportation and storage capacity. A 10,000 barrel per day exemption will ensure the smallest oil producers are not unduly affected. The reduction reflects broad consensus in industry and input gathered by expert envoys appointed in November to work with oil companies on solutions to the oil price differential. Premier Notley’s fight to get top dollar for our energy resources includes a made-in-Alberta strategy to build new pipelines, invest in new rail capacity, and add value through more upgrading of oil and gas here at home. Combined, these efforts will create thousands of new jobs and attract tens of billions of dollars in new private investment. Alberta currently produces 190,000 barrels a day more than can be shipped using existing pipeline and rail capacity. In total 35 million barrels of oil are in storage – about twice the normal levels. The price differential for Western Canadian Select (WCS) versus West Texas Intermediate (WTI) has been around $30 to $50US recently, peaking at $52 in October. Using methodology from Scotiabank, revised based on the wider light and heavy differentials, it’s estimated that the discount on Canadian oil caused by pipeline bottlenecks now costs the Canadian economy more than $80 million per day. A reduction of 325,000 barrels a day, or 8.7 per cent, will reduce market volatility and is estimated to narrow the differential by at least $4 per barrel relative to where it otherwise would have been and will add an estimated $1.1 billion of Alberta government royalties in fiscal year 2019-20. Applied at the operator level. First 10,000 barrels per day excluded. Baseline calculated at best six months in part years. Applies to oil sands and conventional. The Alberta Energy Regulator will administer the reduction using the existing Responsible Energy Development Act. The initial curtailment of 325,000 barrels per day (8.7 per cent) is expected to drop over the course of 2019. The government will review the amount every month and adjust as needed, so as not to impose a steeper drop than is necessary. The level of curtailment for each company will be based off its six months of highest level of production over the past 12 months. Additional oil takeaway capacity is expected to be available in late 2019, in part through Alberta’s major investment in crude-by-rail transport.